To species of their own kind they are very aggressive. The aquarium should be set up with rocks and stones that form caves and hiding places, and a sandy bottom. In the middle you should leave enough free swimming space. They dig in the substrate now and then. You should give them all kind of live food. Beef heart and some vegetable food such as lettuce or spinach is eaten as well. They accept dry food too. Breeding is not easy. The female takes the eggs in her mouth after spawning. It is important that she is not startled, because she spits them out again. A regular changing of the water is necessary. The rest of breeding is just like other mouthbrooders. Usually not aggressive towards species other than its own. 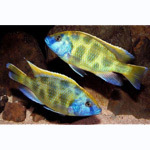 Males are very territorial and will generally kill any other male venustus.